To set among young warriors preparing for higher goals in the Army is an awesome, powerful feeling. The commitment, strength, professionalism, and determination among the men and women for the annual awards and recognition ceremony of the Army ROTC Eagle Battalion at Embry-Riddle Aeronautical University is compelling to say the least. They have worked very hard throughout the year in their academics at ERAU and their ROTC training, along with the providing their services where needed in the community. Their recognition this day commends them of their success. It’s my privilege to present each year the Crosby Army ROTC Scholarship to one of these fine, young cadets. This year the scholarship was awarded to Cadet Austin Moore. Cadet Moore is very deserving of the scholarship which I am so proud to present on behalf of our family and my brother, Capt. Herbert C. Crosby, who the scholarship is named for. Cadet Moore is from Melbourne, Florida, Brevard County. This is the same county I live in so he’s a hometown guy sort of. (I live in the north end of the 79-mile long county and he is from the south end.) Austin has excelled in his academic career at ERAU in the ROTC program. He majored in Air Traffic Management with a minor in Meteorology, top rankings in class. 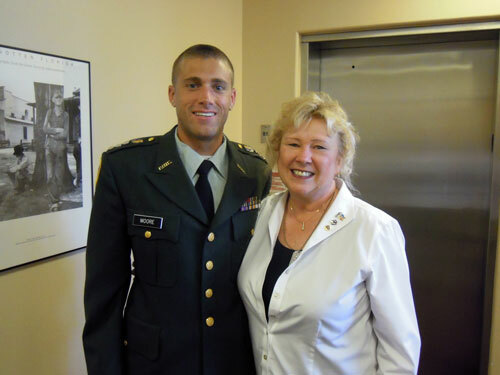 He was the 2009 Army ROTC Superior Cadet and now, 2011 Distinguished Military Graduate. He will be commissioned next month [May] and receive his official orders to report for duty. It was so nice to talk with Austin as he told me of his goals for the future. He wants to be a helicopter pilot and is planning to be stationed at Fort Rucker, Alabama for flight training. Fort Rucker is where my brother, Capt. Herbert C. Crosby received his training which makes a great connection to Herby. I know Herby would be very proud of this young man who wants to fly, fly helicopters and defend our country. Congratulations Cadet Austin Moore!